We celebrated the All-New Wrangler and the Blu-ray and DVD release of Jurassic World: Fallen Kingdom by paying homage to the original Jurassic Park movie from 1993, where the Jeep® Wrangler is the ultimate get-away vehicle to escape from a pursuing T-Rex. Fans who made their way down to Southbank, London, were able to relive the movie classic by having their picture taken in the All-New Jeep® Wrangler, with a life-size replica T-Rex in hot pursuit! 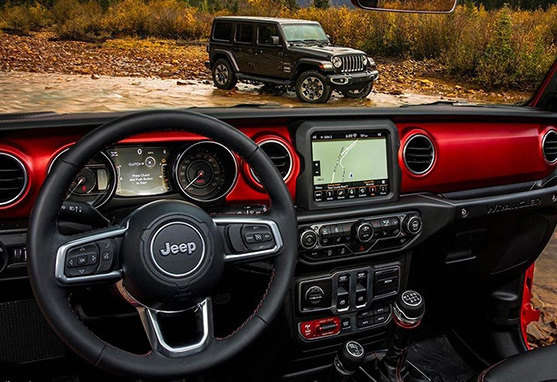 The All-New Jeep® Wrangler's interior is designed to match the most daring spirit, with the best quality, comfort, security and state-of-the-art connectivity. Discover the 8.4’’ touchscreen infotainment system with Apple and Android smartphone compatibility. Hop in and get ready to enjoy a driving experience you’ll never forget. The All-New Jeep® Wrangler might look familiar, but, if you take a closer look, you’ll see upgrades and smart improvements at every turn. While the Wrangler has greatly improved, it manages to stay true to its heritage. 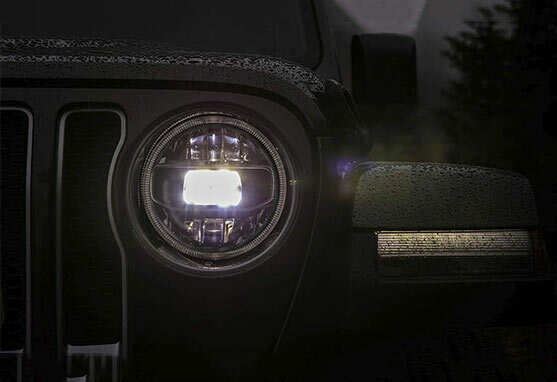 That means you can expect the same iconic styling, round headlamps, the legendary seven-slot grille inspired by the Jeep® CJ model, flat fender flares, removable tops and doors and easily foldable windshield that you're used to.